Retrieving is perhaps the most popular and widely admired aspect of gundog training. It is also one of the most complicated and ‘prone to error’ processes that we teach our gun dogs. And a huge topic on which I receive many questions. From the most basic “How do I teach my dog to retrieve?” to complex questions on directional control. Retrieving is a BIG topic! As many of you will know, neither I, nor anyone else, can tell someone how to teach a dog to retrieve to any kind of worthwhile standard, in a single article. Indeed there are so many aspects to retrieving, so much to be said about it, that I seem to be accumulating a great many articles just on this topic. The purpose of this one, is to try and put all the others in some semblance of order. So that you can find what you need, when you need it. There is a notion that retrieving is something natural rather than something taught. The truth is more complex. Many new gundog owners are surprised to find that polished retrieving, in all its glory, does not necessarily come naturally to their dog. But before you decide your dog is badly bred, or that you are a rubbish trainer, take heart. Many new (and not so new) gundog owners have a problem simply getting started with a basic retrieve. Either with a puppy, or with an older dog. Never mind progressing on distance control! Some dogs don’t like picking up things that have stopped moving, so they’ll chase a ball or dummy as it flies through the air or bounces along the ground, but lose interest when it comes to a halt. Some dogs will fetch a couple of times, then get bored and wander off. You may be wondering how you are supposed to practice and improve with a dog that can’t be given more than two retrieves a month without losing interest. Some dogs won’t deliver the dummy to the handler. Some will pick up the retrieve but drop what they are carrying before reaching you. Others will return but won’t let go, or will run around you in circles, or spit the retrieve onto the ground instead of placing it in your hand. Some will chuck the retrieve around in the air, chomp on it, or engage the dummy in a happy game. It can be incredibly frustrating to find that you cannot move on to advanced retrieving, or indeed make any progress with retrieving at all, because your eighteen month old dog is still messing around with the dummy like a puppy. Or can no longer be bothered to retrieve. These are really common problems. There are a probably a hundred different ways that delivery and retrieving can go wrong. And as many different opinions and traditional techniques for dealing with these errors in training and management. Many of these techniques are very useful, but most work with some dogs and not others. Traditional retrieving help often needs to be tailored carefully to each individual dog. What is required, is a strategy or path that can be followed by anyone anywhere, and that will benefit every retriever. The strategy involves imposing a formal ‘trained delivery process’ on top of a ton of powerful retrieving desire, to get the results that you want. A natural, fast, stylish retrieve, that is under control every step of the way, including at the finish. You don’t want a dog that is ‘half hearted’ over retrieving. 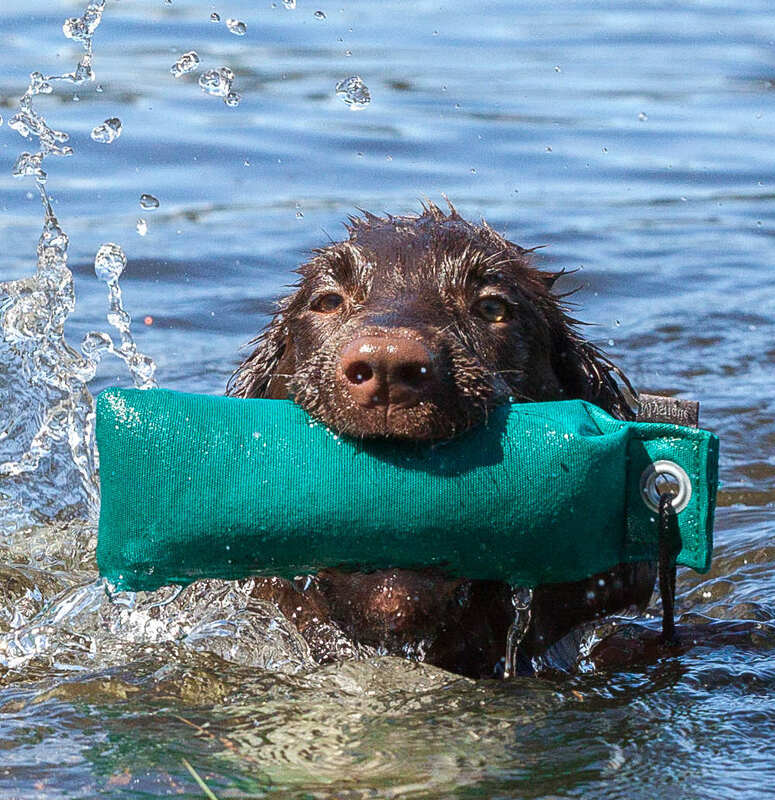 You want to be able to practice retrieving on a regular basis, with more than just one or two throws of a dummy. This is why retrieving begins with building desire. Without it, we cannot progress. Whilst we all want a dog that is keen to get that dummy in his mouth, we also need him to give it back again. You don’t want a dog to want that dummy so much, he won’t hand it over. You want him to return with it, hold it until you are ready to take it, then place neatly in your hand. The trained retrieve imposes a formalised retrieve ‘protocol’ on to the retrieving process. 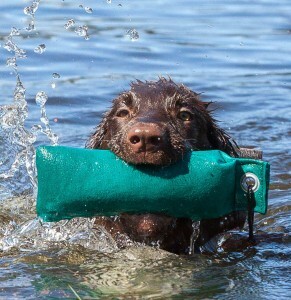 A well designed formal retrieve not only provides the dog with the motivation to return and deliver the dummy. It can also increase the dog’s motivation to get to the dummy in the first place. This means that we win on two counts – we improve retrieving desire, and we get the control we need over the delivery process. In the USA this is achieved using a system call ‘force-fetch’. Here punishment is used to teach the dog to drive forwards towards the dummy in response to any kind of mental pressure or physical discomfort. in the UK we have gone a different route. A growing number of forward thinking British gundog trainers are now starting to formalise the retrieving process using the controversial clicker trained retrieve. Just like force fetch, the clicker retrieve gives the handler complete control over the delivery process. And just like force fetch, the clicker retrieve can be used to create a desire to pick up a dummy, in a dog that lacks natural desire or (more commonly) that has had that natural desire squashed by poor handling. Like force-fetch, the process is best imposed on a dog that already has natural retrieving desire but unlike force fetch, the clicker retrieve is entirely positive and involves no form of pain, intimidation or punishment. Clicker training for gun dogs is controversial, because until recently, in gundog circles, the clicker was considered a ridiculous toy for teaching tricks to pet dogs. Fortunately, we now have some FTCH retrievers that have been clicker trained, and the myths about clicker training are at last being put to bed. It is a reliable and enjoyable way of formalising the retrieving process so that your dog picks up and delivers every dummy on your terms. Every time. Properly taught, it gives you a dog that can be asked to complete multiple retrieves on a regular basis, because it does not rely purely on natural desire. The level of control you get with the clicker trained retrieve is such that I very much doubt anyone now using it would ever go back to traditional techniques. OK, so we have covered desire and control – let’s now look at Phase 2 in the retriever training process. The next major sticking point in the retrieving process for many people is directional control.The purpose of directional control is to direct a dog onto a blind retrieve. This requires that the dog can accurately hold a line when sent out from the handler’s side, will stop on cue, turn in any direction on cue, and hunt on cue. There are a lot of different skills involved here. And people get in a terrible muddle by trying to teach directional control at the same time as giving the dog increasingly challenging blind retrieves. Essentially they are trying to run before they can walk when it comes to stopping and directing the dog. It is important that we don’t plunge straight into blind retrieve training using genuine blind retrieves. That way lies failure. We teach the dog the principles of directional control, the concepts involved, using marked retrieves first. All behaviour needs to be reinforced if we want to motivate the dog to repeat it, and the reinforcement or reward that the dog gets for obedience to handling cues is the retrieve itself. This is one of the reasons that we want natural desire as well as training and control. It is vital that this reward (the retrieve) is freely and easily available. At least to begin with. And that’s why we start with marks. The aim is to build up the dog’s handling skills without jeopardising his chances of success. And this has to be done in easy stages to keep the dog enjoying the process and believing in you. To become proficient at blind retrieves your dog needs drive, confidence, and skill. We have talked about building drive, and about building handling skills using marked retrieves. But what about building confidence? And how do we move from handling on marks to handling on blinds? The best confidence builder is always success. So we build up our blind retrieving skills by starting with blinds that are so easy, the dog cannot fail. We start by making the first true blinds ridiculously simple. We prop up the dummy so that the dog can see it. We make sure there are no obstacles en route. We make the distances so short that he can get a visual mark on the dummy almost as soon as he has set off. We use transitional blinds before moving to true blinds. We use permanent blinds – familiar places where the dog can predict there will be a retrieve. And pattern blinds – blind retrieves that are set out in a predictable way. As our practice blind retrieves get longer we use markers that the dog can see them as he approaches them. We also re-run blinds that we ran the day before, and we run blinds with a marker and then without. We do whatever we can to ensure the result we want. All these ‘cheats’ are ways to build a retriever so brimming with confidence that he never falters en route, and goes ‘as sent’ every single time. They help to guarantee success when he gets onto the real thing. Some people worry that formalising the retriever training process, will reduce the need for natural ability in our gundogs. I do not believe that this is the case. Breeding and genes are important. Natural ability does come into it. Most well-bred gun dogs enjoy chasing after a moving object and are capable of carrying objects very gently in their mouths. A dog with natural desire is always going to be a joy to watch and handle. Natural desire also provides the dog with additional motivation to respond to your signals and enables you to use the retrieve itself as a reward. Fanning the flames of that natural desire at an early stage is important. But getting individual aspects of the retrieve to a standard where you and your dog can work as a team, is rather more involved. Do your dog a favour and add some structure to your retriever training programme, so that you build each new skill on a solid foundation. Training is not really cheating, it’s just good sense. If your dog does not deliver naturally to hand from an early age, don’t despair. He is in good company. Retrieving may be natural, but much of the time a neat and tidy delivery is not. To get a really reliable retriever, one that delivers to hand, can be controlled at a distance, doesn’t get bored with the whole game, and that faces all kinds of obstacles without giving up, we need to implement some considered and organised training. Appropriate training in conjunction with powerful natural instincts will provide you with a dog that retrieves every time, without question. What we are doing, in effect, is building a retriever, from the ground up, and having fun at the same time. I hope you find the growing library of articles linked here useful. Have fun with your retriever training, and break it down for him, into easy stages. And don’t forget to let me know how you are getting on, and what kind of articles you would like to see here next.